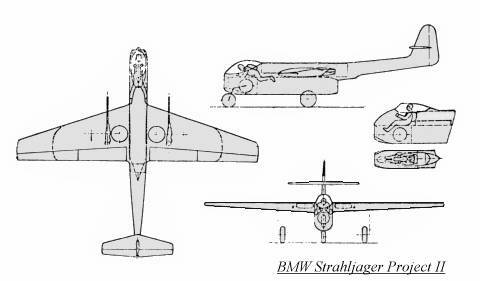 Since BMW was heavily involved with the production of the BMW jet engines (BMW 003 and BMW 018), the development of new designs was handled by EZS, a subsidiary of BMW. Four designs that emphasized simplicity and ease of construction were submitted, under the direction of engineer Dr. Huber, on November 3, 1944. The second design had several variants, with the pilot either prone or sitting, and with short and long wingspans. The air intake was in the nose and ducted under the cockpit to the BMW 003 engine mounted in the rear fuselage. The wings featured a small amount of sweep on the leading edges; the trailing edges were straight. Projected armament was two MK 103 30mm cannon mounted in the wings.